Irregular periods have become one of the most common problems in women today. The reasons are several such as hormonal imbalance, stress, lack of sleep etc. Though hormonal imbalance stands first on this list, stress and lack of sleep can be minor contributors to this as well. The right method of treatment is to take medical treatment, but when home remedies are clubbed with medications, results can be more positive. 1.Papaya in the form of juice or the fruit itself eaten regularly about one week before your cycle can help in getting your cycle in time. 2.Eating dark chocolate on an empty stomach on a day or two before your cycle date is also beneficial. 3.Soak figs overnight and blend it in the morning. Drink this throughout the day. 4.Make a paste of radish and mix it with buttermilk. Drink this sometime in the day. 5.Boil some coriander leaves in water for 20-30 minutes and cool it. Strain the coriander leaves and drink the coriander decoction thrice a day. 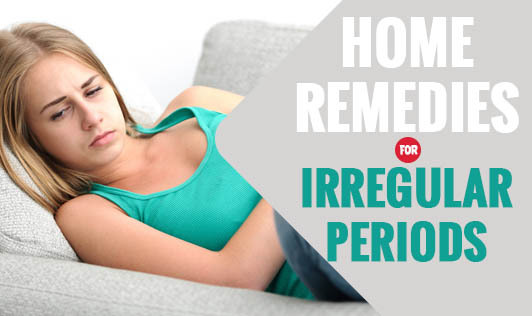 These are some of the simple home remedies for irregular periods. As these have not been scientifically proved, it is best to be clubbed with your medications. Diet alone may not help in regularizing your menstrual cycle. Also remember a good exercise routine, good sleep and a balanced diet will also have equal contribution. Also, allergies or intolerances to any of the above remedies should be taken into consideration.